Liberty Center makes its debut October 8th. Area residents are looking forward to finally have upscale shopping, entertainment and food within driving distance. Liberty Center and the availabilty of land is promoting lots of development in the area. Cabela’s is scheduled to open August 19th and will be located on the south side of the road from theLiberty Center. 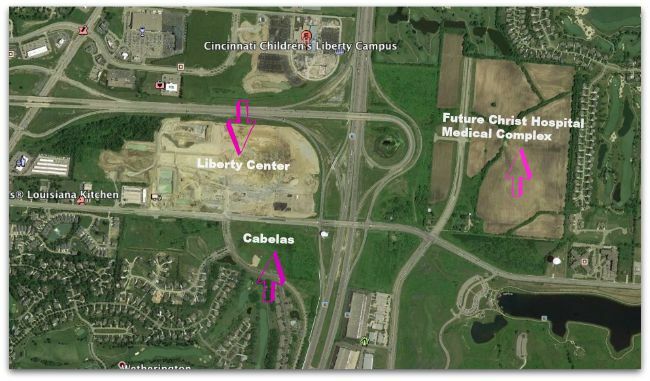 Both Liberty Center and Cabela’s will be located to the west as you get off the I-75 Liberty Way exit. Head east off the exit and you’ll find another new commerical development – where The Christ Hospital Health Network plans to begin construction in October on a multimillion-dollar medical center in Butler County’s Liberty Township. The one big question -how will the existing roads handle all this traffic? Work is curently underway to add a lane to both ramps from I-75 but nothing is happening to handle eastbound traffice frome 129. The Liberty Center is touted as similar to Easton in Columbus – which is a beautiful well developed complex with extra exit lanes as well as additional driving lanes from all directions. Easton sits approximatley a half to three quarters of a mile from the freeway exits -allowing traffic from both directions to keep moving. It doesn’t take a rocket scientist to see the potential for “Kenwood Towne Centre” like traffic to block Liberty Way in all directions. Delvopment of great-checking with the people who drive the area on a daily basis might lead to better traffic conditions. Residential real estate is affected by lots of things and difficulty getting home after a long day may discourage potential buyers in the future.